What a great idea to rent a pool for the weekend. Those images are fabulous! Thanks for always sharing such rad art. The first thing I thought of were cloth napkins. I am a sucker for cloth napkins. They feel like such a luxury and are oh so adult. I get the impression that most people our age don't really use them because they are a pain, or maybe don't even own them, but I have a small collection and use them literally all the time. My love for napkins is definitely genetic. My parents will invite 50 people over for a party and my mother will have cloth napkins and real dishes for everyone, in fact my chore growing up was to iron all of them! It probably sounds so traditional and maybe old-fashioned, but I feel like it's such great way to dress the table and make your guests feel welcomed and special in that "I stain-treated, washed and ironed this damn napkin for you, so you can wipe your spaghetti face all over it, that's how much I like you" way. 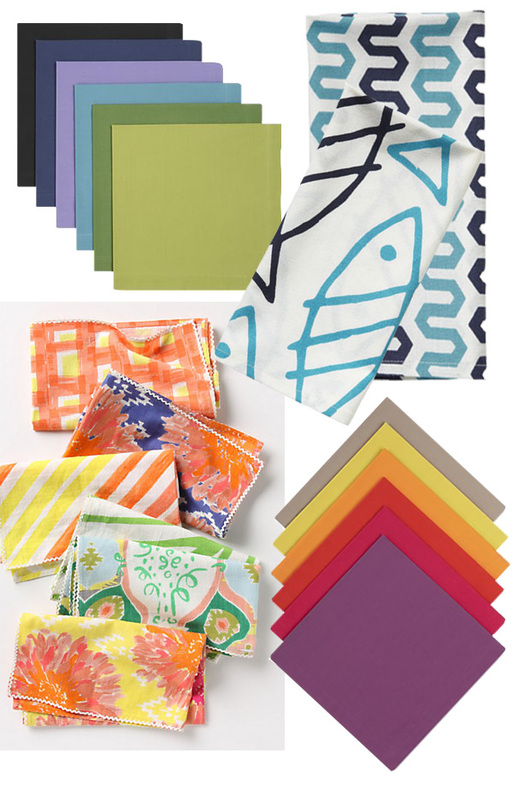 My go-to napkins for every-day use and causal dinners are a collection of assorted color cloth napkins from Crate & Barrel (that's what I got Lil' Q). It's $45 for a set of 12. I received these at a wedding shower from Lil' Q and her Mom, actually.... I guess we're just napkin swapping. Here are some more options that I just love. And here are some of my personal faves. The blue on the left were made by my mother-in-law and the floral embroidered on the right are a gift from my cousin Nicole. They are gorgeous and fancy and I don't use them when serving spaghetti. What do you think? Crazy and a waste of time, or fabulous, running out to get these now? I love the idea...but it is such a chore! 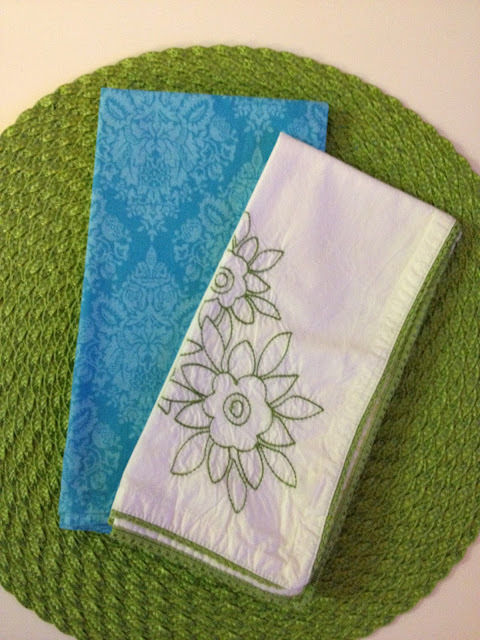 However, when I lived with a French family in Paris during my semester abroad, each member of the family had their own unique cloth napkin that was "theirs" and used a few times before the wash was done and we were reassigned our new napkin. Obviously this wouldn't work for entertaining, but I love the idea for every day family use of something more than a white paper napkin. If there is one thing that reminds me of growing up with the Pregliasco's, it would be cloth napkins. They even make me feel like I'm at home! I grew up in cloth napkin house! But man, leave it to the French to come up with an easy and low key way to do this. I have a bunch of them and love them, but gotta say, do NOT have the energy to iron them. No sir!